Mostafavi S.M., Boutorabi S.M.A., As-cast acicular ductile aluminum cast iron, Journal of Iron and Steel Research International, 2009, 16, 23-28. Liu, X., Takamori S., Osawa Y., and Yin F., Damping characteristics of cast irons with aluminum addition, Journal of Materials Science, 2005, 40, 5565–5567. Rundman K.B., Metal Casting, Department of Material Science and Engineering Michigan Technology University, 2000, 17-19. Silman G.I., Makarenko K., Graphitized Cast Irons, Metal Science and Heat Treatment, 2014, 56, 63-69. Everest A.B., The influence of aluminum on an iron-carbon alloy, Foundry Trade Journal, 1927, 169-173. Petitbon E.V., Wallace J.F., Aluminum alloyed gray properties at room and elevated temperature, AFS Cast Metal Research Journal, 1973, 127-134. Carlberg T., Fredrickson H., Influence of silicon and aluminum on the solidification of cast iron, solidification and casting of metal, Metal Society, 1977, 115-124. دیواندری، م.، بررسی روش تولید و خواص چدن‌های پر آلومینیم (20 تا 25 %)، پایان‌نامه ارشد، دانشکده مواد و متالورژی، دانشگاه علم و صنعت ایران، 1368. Sidjanin L., Smallman R., Young J., Electron Microstructure and mechanical properties of silicon and aluminum ductile irons, Acta Metallurgica, 1994, 49, 3149-3156. Haghdadi N., Bazaz B., Erfanian-Naziftoosi H.R., Kiani-Rashid A.R., Microstructural and mechanical characteristics of al-alloyed ductile iron upon casting and annealing, International Journal of Minerals, 2012, 19, 812-820. Zandira M., Boutorabi S.M.A., Fracture characteristics of austempered spheroidal graphite aluminum cast irons, Journal of Iron and Steel Research International, 2010, 17, 31-35. Hellawell A., Aluminium-Silicon Alloys and Cast Irons: Commercially Important Anomalous Alloys, 1981, Chapter 5. R. Elliott, Cast Iron Technology, Butterworth and Co. (Publishers) Ltd, London, 1988. Boutorabi S.M.A., Young J. M., Kondic V., Ductile aluminum cast iron, Cast Metals, 1992, 5, 122-129. خرازی ی.، دیواندری م.، بررسی روش تولید و خواص چدن‌های پر آلومینیم (20 تا 25%)، مجله بین‌المللی مهندسی دانشگاه علم و صنعت ایران، 1369، 1(1) 23-39. Soiński M., Jakubus A., Kordas P., Skurka K., The effect of aluminium on graphitization of cast iron treated with cerium mixture, Archives of Foundry Engineering, 2014, 14, 95-100. کیانی رشید ع.ر.، گلعذار م.ع.، الگوی جدایش میکروسکوپی آلومینیم (Al) و سیلیسیم (Si) در ریزساختار زمینة چدن‌ها با گرافیت کروی، نشریه استقلال، 1382، 22، 177-188. Moore W., Lord J.O., Gray cast iron machinability: quantitative measurements of graphite and pearlite effects, AFS Transactions, 1959. Riposan I., Chisamera M., Stan S., Toboc P., Grasmo G., White D., Ecob C., Hartung C., Benefits of residual aluminum in ductile iron, Journal of Materials Engineering and Performance, 2011, 20, 57-64. Soiński M., Susek P., Hübner K., The low-aluminium cast iron of reduced silicon content treated with cerium mischmetal, Archives of Foundry Engineering, 2008, 8, 123-128. Soiński M., Jakubus A., The Influence of Small amounts of Aluminum on The Effectiveness of Cast Iron Spheroidization with Magnesium, Archives of Foundry Engineering, 2013, 13, 80-83. Riposan I., Chisamera M., Stan S., Skaland T., A new approach to graphite nucleation mechanism in gray irons, in Proceedings of The AFS Cast Iron Inoculation Conference, Schaumburg, Illinois, 2005, 31–41. Shayesteh-Zeraati A., Naser-Zoshki H., Kiani-Rashid A.R., Microstructural and mechanical properties (hardness) investigations of Al-alloyed ductile cast iron, Journal of Alloys and Compounds, 2010, 500, 129-133. کیانی‌رشید ع.ر.، تاثیر آلومینیوم موجود بر نمودارهای فازی تعادلی Fe-C-Al-Si، نشریه مهندسی متالورژی و مواد، 1388، 21، 1388. Kiani-Rashid A.R., Influence of austenitizing conditions and aluminum content on microstructure and properties of ductile irons, Journal of Alloys and Compounds, 2009, 470, 323-327. 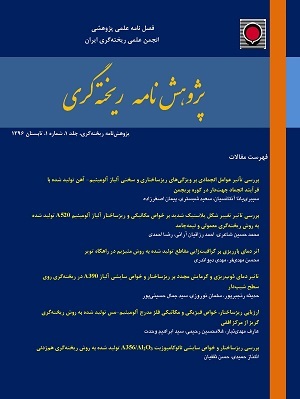 Boutorabi S.M.A., Ph.D. Thesis, University of Birmingham, May 1991. ورهرام ن.، اثر دانه‌بندی آلیاژ کروی‌کننده در ساختار میکروسکوپی و تعداد گرافیت، ریخته‌گری، 1364، 7(24) 1-10. پور‌آرین ا.، دیواندری م.، بررسی تاثیر ماده کروی‌کننده بر مورفولوژی گرافیت در فرایند ریخته‌گری منیزیم در راهگاه توپر، ریخته‌گری، 1390، 30(97) 40-50. ملکی س.، دیواندری م.، خرازی ی.، تاثیر دمای ریخته‌گری و سرعت سرد شدن بر روی ساختار و خواص مکانیکی در چدن نشکن تولیدشده به روش منیزیم در راهگاه (in-mold)، ششمین همایش علمی-دانشجویی مهندسی مواد و متالورژی، 1385، 153-157. Cast iron, determining of features of graphite precipitates, Polish Standard PN-EN ISO 945. عجمی ب.، دیواندری م.، عربی ح.، بررسی تاثیر مدل فومی بر روی مورفولوژی گرافیت در صفحه‌های ریخته شده به روش منیزیم در راهگاه توپر، پنجمین همایش مشترک انجمن مهندسین متالورژی ایران و جامعه علمی ریخته‌گری ایران، دانشگاه صنعتی اصفهان، 1390. بافتی ح.، حبیب‌الله‌زاده ع.، محمدنژاد م.، تاثیر عامل حلالیت و فاصله راهباره از محفظه واکنش بر تولید چدن نشکن در فرایند افزودن منیزیم در راهگاه، دومین همایش مشترک انجمن مهندسین متالورژی ایران و جامعه ریخته‌گران ایران، 1387، 1-9. Aleksandrov N., Il'icheva L., Structure of cast iron alloys containing aluminum, Metal Science and Heat Treatment, 1963, 5, 646-650. Haque M., Young J., Production of spheroidal graphite aluminum cast iron and the factors affecting it, Journal of Materials Processing Technology, 1995, 55, 186-192. Fe-C-Si-Al و Fe-C-Si، اولین همایش مشترک انجمن مهندسین متالورژی و انجمن ریخته‌گری ایران، 1386. خالوان م.م.، اثر مقدار آلومینیم بر ساختار چدن نشکن تولید شده به روش منیزیم در راهگاه، پایان‌نامه کارشناسی ارشد، دانشگاه علم و صنعت ایران، 1396.